The field of biology that involves the study of organ tissues is called histology. Scientists who study the tissues of bones are called bone histologists. All bones, no matter which species of animal they are from, are made of bone tissue. Why do we study dinosaur bone tissue? We study dinosaur bone tissue to learn how old dinosaurs were when they died and how fast they grew, among other things. How do we study dinosaur bone tissue? We first take a very thin slice of the fossil bone (usually an arm bone, leg bone, or rib), and glue it to a microscope slide. We look at the bone tissue through a microscope in order to see tiny structures, like bone cells and blood vessels, that would be too small to see with our eyes or a magnifying glass. We use a microscope to look at dinosaur bone tissue. 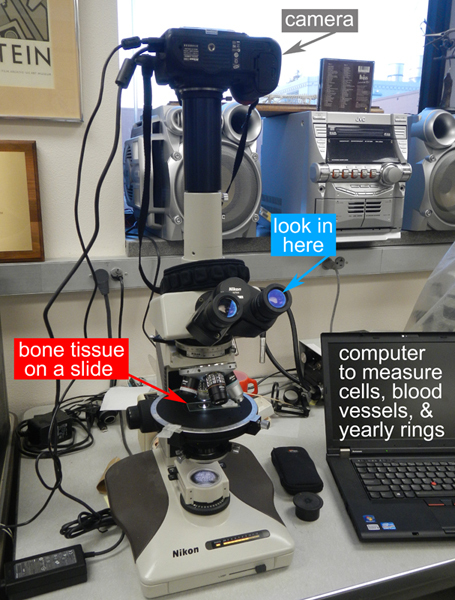 Our microscope has a camera to take pictures, and a computer for counting and measuring different parts of the bone tissue. How fast did dinosaurs grow? Dinosaurs grew much faster than living reptiles. We can see evidence of this in their bone tissues. Animals that grow fast have many more blood vessels (arteries and veins) in their bone tissue compared to animals that grow slowly. Blood vessels carry nutrients, oxygen, and building materials to growing bones. Animals that grow fast need lots of nutrients and materials to build strong bones quickly! Bone cells build and maintain bone, and they are also more numerous in animals that grow quickly. Finally, the space between yearly rings is bigger in animals that grow faster (see How old was Joe? for more on yearly rings). 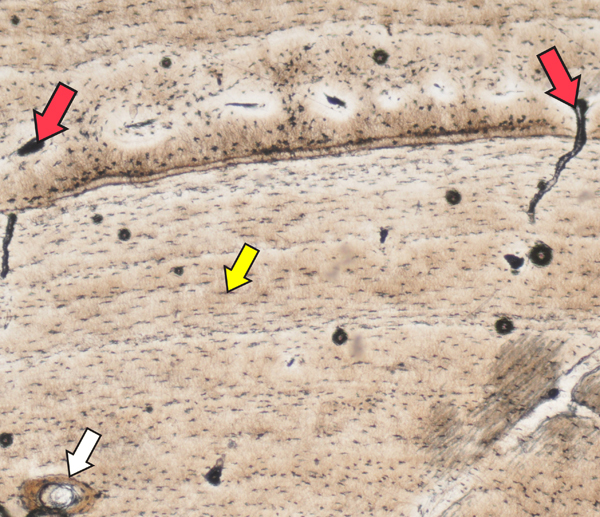 In this slice of “Joe’s” bone, we can see blood vessels (red arrows) and bone cells (yellow arrows), which look like pepper flakes. The faster an animal grows, the more blood vessels it needs to carry nutrients and oxygen. It also needs more bone cells to build and maintain the bone tissue. “Joe” has a lot of blood vessels AND bone cells, so we knew “Joe” grew fast! In this slice of crocodile bone, there are blood vessels (red arrows) and bone cells (yellow arrow), but not as many as “Joe” had! That is because crocodiles today grow much slower than dinosaurs did. 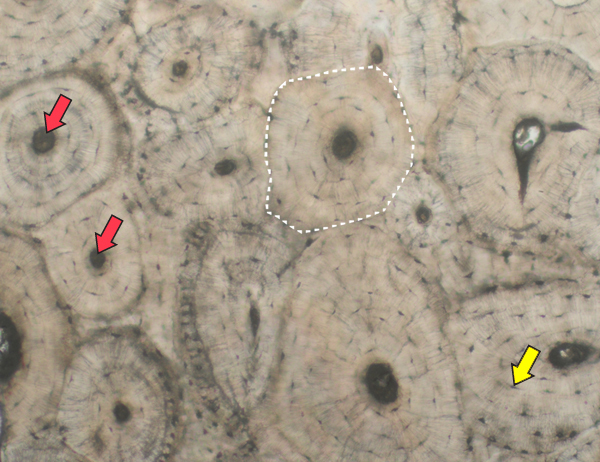 We also see a circular osteon (white arrow), a sign that this crocodile was repairing its bone tissue. The horizontal lines below the red arrows are yearly rings, similar to yearly rings in trees. Image (c) 2013 Sarah Werning. What does human bone look like? Human bone has many of the same features as dinosaur bone, including blood vessels and bone cells. However, it looks different from dinosaur bone because human bone tissue repairs and replaces itself throughout life. In a process called bone remodeling, old bone tissue is dismantled and replaced with new, semicircular units of bone called osteons. Each osteon has a blood vessel at the center, and bone cells line up in little rings around each blood vessel. Dinosaurs did not remodel their bones as much as humans, and so they did not form circular osteons until they were adults. “Joe” does not have any circular osteons; this is another piece of evidence that “Joe” was not an adult. 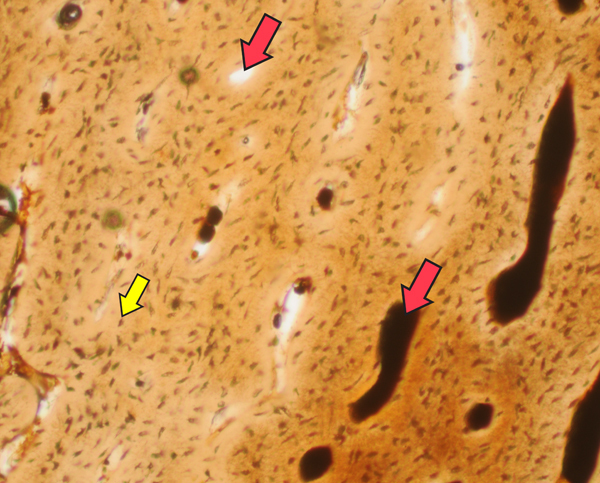 In this image, we see blood vessels (red arrows), bone cells (yellow arrow), and osteons (dotted lines). Human bone tissue has many circular osteons, which form as bone is repaired and replaced. This process happens throughout life, even before birth. Image (c) 2013 Sarah Werning.